One of our most popular olympic barbell sets! BARBELL FEATURES: 7ft long, 30mm shaft diameter, chrome finish for corrosion resistance. Good for home use. 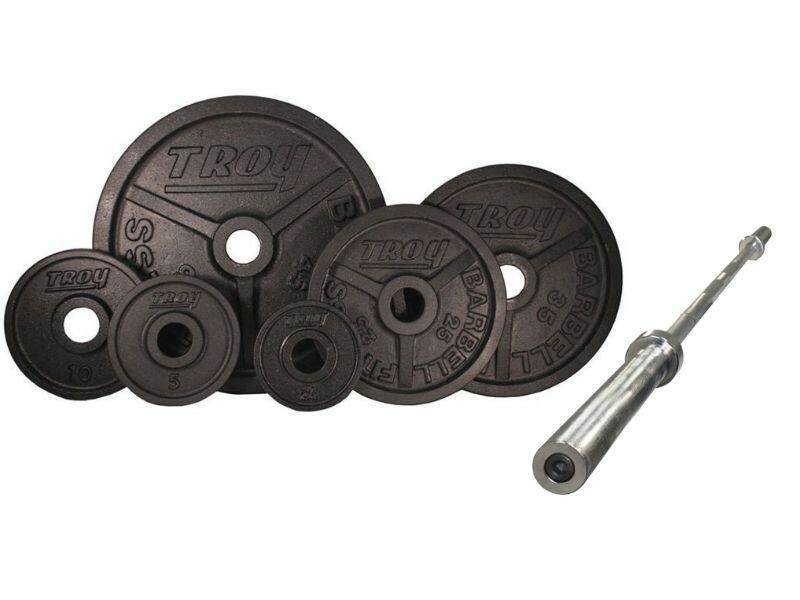 These Troy premium plates are the best ones that Troy makes. After the enamel finish is applied, the plates are rolled through an oven to bake it on, hardening the finish for an ultra-durable surface that is resistant to corrosion and abrasion and won't chip away. The weight accuracy is guaranteed to be within 2% of the marked weight, plus or minus, or we will replace them for you. Most are well within that range and closer to dead-on accurate. Dimensions for all plates of this style below. The 100 lb are not included in this set but can be added separately.